I have been meaning to write this review for quite some time but just haven’t gotten around to it. I’ll view it as more time that I had to use the tools so it’ll make for a higher quality review, you believe that right? At this point in time I own around 13 floats, have invested somewhere around $1000 in them and have made dozens of planes with them. I believe this experience means that I am almost good enough to wipe the shoes of an 18th century plane makers’ apprentice. In our modern day that translates to “I’m a blog writing expert on the subject”. In all honesty, I have used them enough to get a good feel for which ones I prefer, how comfortable they are to use and what my purchase experience was like with the company that makes (or distributes) them. I’ll also throw in a bit at the end on which ones you should buy if you mean to start making planes. Liogier side floats, push and pull – $45 ea. Liogier 1/4″ (6mm) mortise floats, push and pull – $45 ea. Mazzaglia Tools mortise float, pull – $85 ea. Iwasaki side float, only available in push – $45 ea. Iwasaki edge float, only available in push – $45 ea. Philly planes edge floats, push and pull – $70 ea. Lie Nielsen edge floats, push and pull – $50 ea. Lie Nielsen small cheek floats, push and pull – $60 ea. Note that if I acquire all of the floats in this list I will own what I believe are every float professionally made today, not counting individual craftsman in their own shop.But first, what is a float? The best way to describe it is a cross between a file and a thick kerf saw. It’s quite useful for cutting and shaping material in difficult to reach places, notably the mortise in a molding plane. They have been around for at least two centuries and the best we can tell is that they’re really an offshoot of a file and have really been specific to plane makers and gunsmiths over that time, which came first is anyones guess. They have also been adopted by cabinetmakers and luthiers and other professions as they proved most useful for refining joints and hard to reach places in traditional woodworking but more on that some other time. As a result of being related to a saw they also have similar tooth geometries such as rake, fleam, slope and pitch. An in depth discussion of those properties will be reserved for a future article but for now you should know that they are *closely* related to a saw, perhaps more so than a file. Or maybe not? In addition to that many (most?) of them come in two flavors: push or pull which means just that, do they cut on the push or pull stroke. Think of the difference between a western and eastern saw, same thing. Really? They’re not related to a saw? I don’t believe there is much of a functional difference in the two, for me it comes down to preference and the job at hand. In some cases you don’t have room to push through so you need to have a pull cut, in other cases it’s the opposite. For me at least, since I grew up on western style push saws, I took to the push floats on my first use. It took a little bit of time for me to adjust to the pull float. Of note, I STILL can’t use a Japanese pull saw. Handle material, workmanship and feel. Blade, quality of steel, hardening, quality of the teeth, sharpness and ease of sharpening. Quality of cut in various materials. Cost. Sensitive subject, I know. Company. How were they to deal with and ship the products. And without further a do, here go the reviews. These floats are all hand made in France by Liogier and have to be some of the finest tools I own. I really can’t say enough about the quality of them, I own several of their hand stitched rasps and these match their quality. Handle: They handle feels fantastic in the hands, it’s made of a quality material (not sure what) and is shaped in a manner that is easy to use for an extended period of time. Thus far the blade has stayed secured in mine over the course of around 6 months. No complaints on this part. Blade: The business end is made of high quality O1 tool steel and is hardened, by my best guess, to around RC60. That makes them quite durable yet easy enough to sharpen on your own. The teeth were well formed and have a rake (angle of attack) that works well for general purpose use. One key piece of this blade is that is has some flex to it unlike the others. It’s just enough so when you’re working the flat side of the inside mortise you can bend it slightly up to reach smaller spots. That’s really quite handy and now I see why even more flex could be beneficial. Finish: The quality of the cut and finish from them is first class, what you’re left with needs 0 work to complete. Cost: These did have to come from France to get to me and at the time shipping was a bit on the costly side. Since then they have introduced a flat shipping rate, I believe $14, which solves that problem. The price for the tool itself is extremely competitive. Company: Great people to deal with my only complaint is that these took around 3 months to arrive and there wasn’t much communication about the status during that period. After a month of not hearing anything I had to email them to find out what was going on. I suppose if you order from them regularly you’ll know these take time to make and receive but as a new customer I didn’t. The overall rating for them is a solid A, you won’t go wrong with one of these. These floats nearly mirror my experience with the side floats so I’ll just say, they get the same grade. That, and to be honest, I haven’t needed to use them all that much. I am going to include two floats in this section for Iwasaki, both the side and edge. These floats are made by Iwasaki and distributed by a number of vendors, I purchased mine from Lee Valley. They also appear a bit different than what I think a “traditional” float would look like, these are almost closer to a file and are smaller. But, don’t let size fool you, these are in fact full featured floats and can very well compete with the big boys. Handle: The handle is smaller and thinner than other floats but does generally feel comfortable in the hand. They are covered in a sort of polymer that has a slightly rough surface which prevents the float from slipping out of the hands. The only real downside to the handle is that it can be uncomfortable to use for extended periods of time, especially if you have large hands like I do. Blade: The blade is smaller than the others but certainly does the same work, in fact in some ways this float might be better than others. I’m not sure what type of steel they’re made out of but it is quite hard, the only downside I see is that there is no way of sharpening it on your own. But, based on how hard it is and the level of sharpness, I don’t see it needing to be sharpened for quite some time. And given the price point I would simply buy a new one. Finish: This is where these floats truly shine, the finish they leave is like that of 400 grit sandpaper. And they do that without feeling like you’re not removing material, you can see it coming off. Cost: These are slightly lower than the others. Company: What can I say, Lee Valley has always been exceptional to me. The price is good, shipping cost is reasonable and things arrive on time and in great shape. The overall rating for these is somewhere around a B/B+ due to the extended use of the handle issue and the inability to sharpen the blade. If you’re just touching things up, this might be the one for you. I use them to finish nearly every surface of the escapement, they are the last float that touches the plane and they excel at this task. These are made in the UK by Phillip Edwards and are available here. I ordered them via his web site and when they arrived I must say I was truly impressed. I might even go so far as “in awe” because I didn’t know a human could make this high quality of what is a “utilitarian” tool. They came with a hand written note from Phil and were the sharpest floats I’ve ever received out of the box. They are so well made I was literally inspired to go make a plane using them. Handle: Bar none these handles are the finest and most comfortable to use, you can tell these are made by a plane maker. I can use these for hours on end without the slightest bit of discomfort or fatigue. The handles are made form mahogany and are simply beautiful to look at. As I design the logo for my company I am going to use these floats on it, they exemplify plane making and are a tribute to the craft. Blade: I would imagine these are made from O1 tool steel and were hardened/tempered quite well. The teeth are made to be fairly aggressive but not too much so depending on how you use them you can go from rough work to fine finish work easily, remember, floats require finesse. As I said before, these were the sharpest ones I’ve ever received and they are at a hardness level that balances edge retention with ease of sharpening. In fact, since receiving them I have only sharpened them once and I have used them on at least 6 pairs of hollows and rounds. Finish: I would say these are comparable to the other edge floats with the exception of the Iwasaki ones (which are finer), they leave a really nice surface that doesn’t require much touch up work. Cost: Higher than the others but that also depends greatly on the exchange rate. Brexit should help us out here a bit. Are they expensive enough to be considered a guilty pleasure? They’re perhaps on the edge but still firmly on the side of affordable. Come to think of it, maybe I should buy that skew float now that it’s down to 1.2:1…. Oh Phil! Company: Phil was in contact with me several times throughout the process letting me know what was going on with my order. It wasn’t an automated message, it was Phil himself talking to me. That combined with the hand written note results in him being a truly class act. I can’t say enough good about him and his product. Couple that with the fact that he’s a fellow plane maker and I would have to tell everyone to buy from him regardless of cost. Come on, help support a fellow bespoke maker! The overall rating for these is somewhere around an A- and the only reason why is due to the cost. These are some of the most expensive floats I own but based on the quality of the work they are absolutely worth every pound and pence. Buy some now. Really. Now. 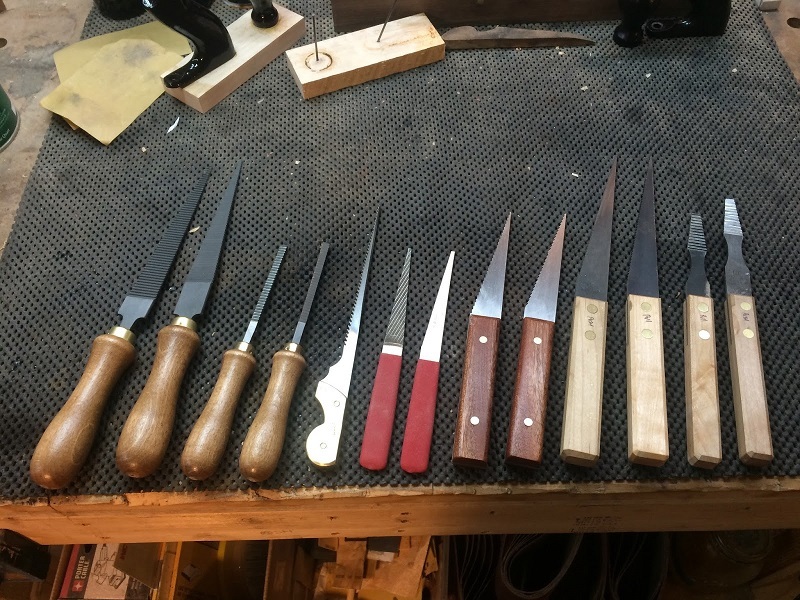 Lie Nielsen, for a while now, has offered several floats and other accessories for building your own molding planes. These floats are the design of Larry Williams of Old Street Tool, whose DVD is available from LN on how to make planes (I highly recommend it). When I first started making planes, these were the first floats I purchased. Handle: As you can see in the first picture, the handles on these are perhaps the largest of all of the floats I have tested here. At first glance I thought the square shape would be uncomfortable to use but after months of having them in my hands I can say they’re just fine. The material and finish isn’t the same quality as Liogier or Philly but for a utilitarian tool it is just fine. Blade: I had read somewhere, or perhaps Larry told me, that LN doesn’t use O1 for these but I have yet to find that in writing anywhere. Despite the material, they are well made, the teeth are spaced for both rough and fine work and they are sharp out of the box. They’re not the sharpest of all of the floats straight from LN but sharp enough. The hardness is a decent balance of edge retention vs. ease of sharpening but these are the one float that I have to sharpen more. Now, it could be because I use the edge float quite a bit but they seem to dull slightly faster than the Philly floats. Also of note is the color, their hardening/tempering process leaves the blade a dull black color. It certainly doesn’t affect performance, it’s just not pretty. Personally, I’m not the kind of guy that’s into pretty tools but I do know some people are. Finish: These, like the Philly floats, leave a good finish behind. Cost: Just slightly higher than the Iwasaki but still quite affordable, especially as a first float. Company: LN does a fantastic job with ordering and shipping, my single complaint has always been the shipping cost. The overall rating for these is a good solid B, it’s above average but compared to the Philly one.. Well, there’s no comparison to that float. If you’re just starting out making planes by all means consider this one as your first float, it’s a really good, down to earth, well made basic float. So, I combined the Iwasaki floats so why did I break out the LN cheek ones? Well, because functionally they’re quite different than any other float I use so they deserve their own section. These aren’t one of the first floats you’d need to make planes but, to me at least, they have become an indispensable tool. These are perhaps the most aggressive floats I own and can open up the mortise faster than any other float. The downside is they finish they leave behind can be a bit rough but that’s easy enough to clean up with another float. This is also the BEST float to use to open up the mouth on a molding plane. Handle: The handle is exactly the same as the other LN. Of note though is that the push and pull handles of mine are slightly different lengths. I’m not sure if this was done on purpose or if a less than perfect blank was used on one or the other. No matter, they work they same but I’m surprised given how LN is known for their extreme quality control before shipping. Blade: Same as the other LN with the exception that it’s super fast to sharpen since there’s just not much metal to it. Finish: These can leave a fairly coarse surface behind, especially across the grain. But, on the inside of a mortise that you are initially opening up this really doesn’t matter. Cost: Same as the other LN but a tad higher. The overall rating for these is a solid B, it’s above average but compared to the Philly one.. Well, there’s no comparison to that float. After an edge and side float this should be the next one you buy. Earlier in the article I said I would tell you what floats you should go with if you’re going to start making your own planes. First, this is for traditionally made planes, if you’re making Krenov style laminated ones you won’t need floats. Keeping cost in mind I would start with 2 floats: an LN side and edge. I didn’t get a chance to review their side float as it was perpetually out of stock. But, I can likely assume it would work as well as their others. If you want a slight upgrade in quality buy the Liogier side float instead of the LN one, it’s well worth the wait. Now, if you want the BEST edge float you can get your hands on, buy the Philly. But that’s only if cost is not a question for you as it is nearly double the price however it’s SO worth it. Buy these 2 in the pull flavor to start with and after you know how to use these buy both of them in a push style at which point you would have (4) floats: side push, side pull, edge push and edge pull. This will get you 90% of what you need with side escapement planes. After this I would purchase the LN small cheek float and again first in push then in pull. And that’s about it, if you have any questions let me know in the comments.